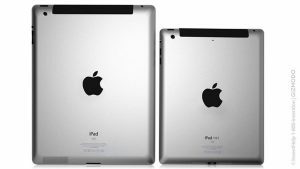 iPad Mini Release Date Announced: Will it Replace the iPad? Despite the absolute overhaul of its current product line at its last press conference, there was a certain product that was missing from the Apple iPhone 5 press release. The heavily rumored iPad Mini was nowhere to be found. Many had speculated that the conference would have been the iPad Mini release date as well, but it turns out that the device may be warranting its own press conference. Apple sent out press invitations today for a press conference on October 23 with the headline of the invitation saying “We’ve got a little more to show you”. Some have pointed out the key word as ‘little’ which they speculate is referring to the iPad Mini, finally making October 23 the official iPad Mini release date. If you haven’t caught up on the details, the iPad Mini is a smaller version of the iPad, probably around 7″ as opposed to the current 10″ model. Other details have been rumored, but not much looks to be confirmed other than the new device utilizing the new Lightning connector. Apple will probably be making it standard across all of its devices. But there has also been dispute as to what other features the device will have. Things like the display quality are still unknown as well as if the device will sport one or two speakers. Ideas of a 3G or possibly a Wifi only device have also been thrown around. Of course we will surely know all the specifics when the iPad Mini release date comes around. The device is likely a direct response to the success of other tablets on the market. Amazon’s Kindle Fire has sold millions and with a 7″ screen Apple will be able to better compete in the that market. However, this does beg the question as to whether Apple will keep its normal 10″ tablet or end up phasing that out as well? The smaller device may not be able to have as much screen resolution and with the smaller amount of retail space, certain features such as 3G and 4G could get cut out. Frankly it comes down to features. If the iPad Mini can do everything the current iPad can, then Apple may move towards it as the standard with the added portability. We saw how much they were able to fit into the iPhone 5 so it makes it all the more interesting as to what the iPad Mini will be able to do.